It was a beautiful day. 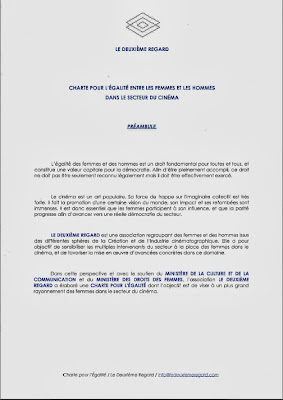 Screen Daily reported that France has launched a five-point gender equality charter for its film industry, put together by Le Deuxième Regard, a Paris-based ‘lobby’ (read ‘activist’) group founded by Bérénice Vincent, Delphyne Besse and Julie Billy, who will circulate it for signature, to all segments of the industry. 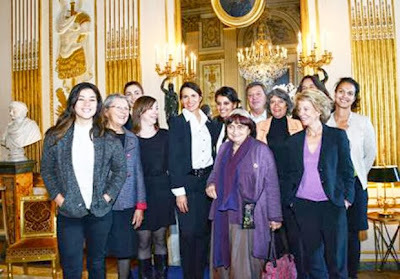 As you can see in the photo, all the first signatories of the charter were women, powerful women: Veronique Cayla, the head of Arte France the public television channel and Le Deuxième Regard's marraine, or 'godmother'; Najat Vallaud Belkacem, the Women’s Rights Minister; Aurélie Filippetti, the Culture and Communications Minister; Frédérique Bredin, president of the Centre National du Cinéma et de l'Image Animée (CNC) – the state film funding body. 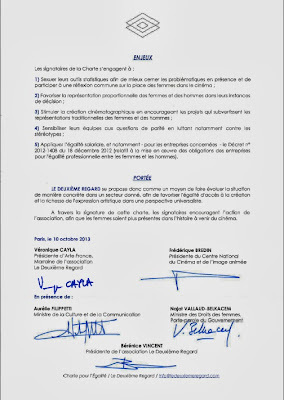 It remains to be seen who else will sign the charter. The Cannes Film Festival, perhaps? Its full name is Charte Pour l’Égalité Entre Les Femmes et Les Hommes Dans Le Secteur Du Cinéma and it's there in all its glory at the bottom of the page. Impressive. 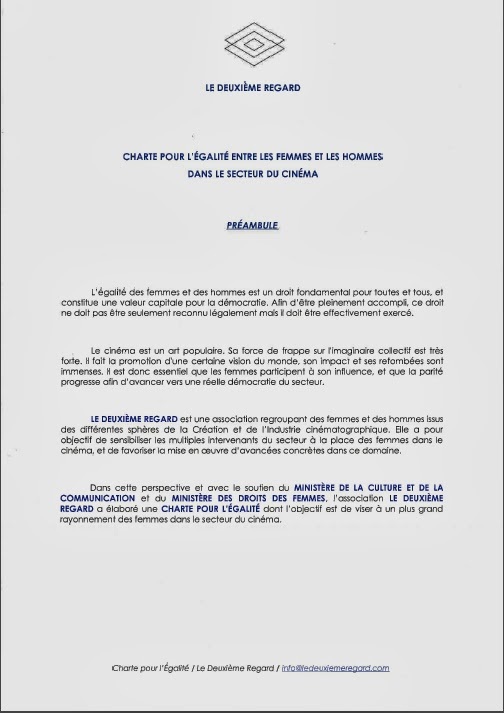 Why is this charter necessary, when in France women directors' participation in feature filmmaking is among the strongest in the world? Well, there are problems there that are similar to those everywhere else. According to the Screen Daily article, the CNC reports that in 2012 women directed just 25% of the 77 first features approved, even though French film school annual intake has a gender split of 50:50. This charter is, I think, unique. Feminists often work behind the scenes for change. But has a feminist group ever initiated and helped to write a charter that key government ministers and industry figures signed in support, in the arts or any other context? And then circulated it for signature, to an entire industry? Anywhere? The charter and its evolving signature process are very different, for instance, from the framework that the Swedish Film Institute uses to advance women directors’ participation in filmmaking, perhaps because the Swedish Film Institute – unlike the CNC – works within an established regulatory context that explicitly promotes gender equity and has monitored gender statistics in film for some time. From here, the charter's creation and use seems like a brilliant activist strategy because the charter hasn't had to go through a long legal process, as a court action or piece of legislation. It appears to have cost the taxpayer nothing. Nevertheless, its formality and the quality of the signatories give it real heft. How did this happen? The charter seems to be the first concrete action following The Place of Women in Art and Culture: The Time Has Come to Move to Action, a French Senate report issued in June. Like the charter, the report is a valuable reference point for other countries around the world. The Place of Women addresses persistent inequality in the cultural sector and identifies three specific problem areas: the maintenance of gender stereotypes in cultural contexts; the comparative invisibility of women artists in those contexts – their absence from retrospectives, major prizes, festivals; and male dominance in strategic places in big institutions. These problems are familiar to women around the globe, especially women artists, and it was very beautiful to read in the report that it was legitimate to explore the possibility of creating places, programmes and events entirely dedicated to women writers, choreographers, film directors and painters. The CNC is schedule to publish its first, comprehensive gender-based report at the end of November. It’s a start but we would also like to see information for the film festivals and private broadcasters which won’t be included in this study. The CNC selection commissions are already split pretty equally in terms of gender but this is not the case elsewhere in the industry. Organisations must also encourage projects that subvert traditional representations of women and men. They must sensitise their teams to parity issues so that they fight against stereotyping. Finally, they must apply equal pay principles. Of course, I wanted to interview Le Deuxième Regard. And was thrilled when its president Bérénice Vincent agreed to respond to questions, which I put together with actor Belinde Ruth Stieve. Belinde's bilingual blog SchspIN addresses the situation of actresses and other women who work in film, in the German and international film / TV industry and she has written about German women behind the camera. She's concerned about the position of German organizations in relation to the points in the charter. Q: How did your organisation get involved in creating the charter? 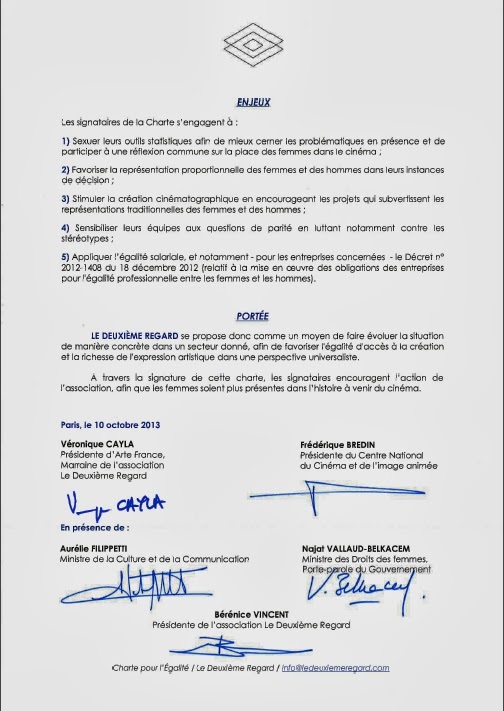 When we officially founded Le Deuxième Regard in March 2013, we got in touch with the Ministry of Culture and the Ministry of Women’s Rights, since we wanted them to be aware of our existence. They were very receptive and we met the Minister’s advisors pretty quickly. We also took part in The Place of Women. The French Senate invited us in for a talk, and we told them about the different actions we had in mind, including a Charter. Q: What was your role in the process? We drafted it. The two Ministry offices changed only one clause, they really trusted us and appreciated the way the Charter was written. Short, efficient and universalist. The office of Véronique Cayla at Arte also gave us much advice. It was really quick. We sent the first draft to the Ministry of Culture at the end of May. Q: How were the five points chosen and negotiated? Are there elements you wish were included, or which might be added? All that we wanted in the Charter is there. It’s a first step of commitment. We need statistics so we can start the discussion with the various players of the industry. Q: Did the existence of The Place of Women make a difference? How? Definitely. 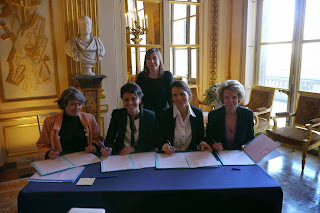 Our meeting with the Senate really helped to establish Le Deuxième Regard as a reference point regarding the question of women in cinema. Q: Did it make a difference that women headed the organizations which were the first signatories? How? Q: What role did Agnes Varda and Julie Bertucelli have? They were invited for the ceremony. Q: What organizations do you think will be next to sign the Charter, and why? Q: What organizations may hold back, and why? I believe the organizations that consider this is not a question, or not a priority. But in my opinion there is no good reason to refuse…. Q: Will you be involved in approaching groups to sign and if so, do you have a strategy in mind? Yes, we will first get in touch with some major players of the industry because they’ll probably have many questions about the implementation of the Charter. And we’ll need a specific contact person in each company to follow up. Q: Were you paid for the work? Will you be paid to circulate the Charter? Q: What advice do you have for activists seeking a similar charter in their own countries? There are several ways: either get political support or the support of some important decision-makers of the industry. Q: What do you imagine ‘sensitise their teams to parity issues so that they fight against stereotyping’ might involve for organizations who sign the charter? First, the organizations need to disclose the few numbers they have. Then, they must explain why this is a real and important matter. Finally, the purpose is to always keep in mind the question of stereotyping: 'Why are there mostly men on this panel?' 'Why did we mostly choose to support male directors in this commission?' 'Why did we mostly select male directors for this festival?' We have to question this lack of female representation. Q: Could you explain what equal pay principles mean in France? Q: Does the charter concern itself only with directors, or with the gender distribution in all crew departments? And do you have any plans for film casts, given the limited parts available for women? The Charter concerns every aspect of the cinema industry including casts; parts for women are about writing, as well. Q: The necessary radical change will be deep and it will take time. Do you have any idea about how long change may take? Have you been in touch with e.g. the Swedish Film Institute about how best to establish deep change. It will take a long time… First, women should learn that feminism is not a bad word. It means aiming at equal rights between men and women. Everyone should be a feminist. Then, men should understand that this question is also interesting for them. Diversity is in the interest of everyone, even more in the interest of artists, who get inspired by what they see, what they read, what they hear. We definitely want to get in touch with the Swedish Film Institute, they are inspiring. Q: From over here, French feminisms are very interesting. I know nothing of the multi-cultural feminisms that must exist but I imagine they’re full of vitality, in the mix with de Beauvoir, the ‘French feminism’ of Cixous & co, the legendary and long-standing Creteil Festival and Cineffable, the wonderful La Barbe and their Cannes petition. How did Le Deuxième Regard come into existence and what are its aims? Where do you fit in the grand scheme of French feminisms? We would be very pretentious to say where we fit among all these great names and initiatives. We’re young and still have a lot of work to achieve before claiming we’ve participated in anything. The Charter is a great first step, but it’s only the beginning. We admire all those women because they opened the way. Le Deuxième Regard is of course a reference to Le Deuxième Sexe by De Beauvoir. Q: What's the basis of your mission? Our mission is to promote the talent of women in cinema and to combat gender stereotypes. Q: I’d love to know more about your founders’ backgrounds if you can share them. It interests me that you’re producers and sales agents. Were you frustrated in your search for projects, in your daily working lives? We’re all around 30 years old and met in our first job at Celluloid Dreams, a great arthouse international sales company. Delphyne Besse stayed in the field of international sales, she worked for Rezo, EuropaCorp, and now Urban Distribution. Julie Billy is specialized in European co-productions and works for Haut & Court. I started in sales like Delphyne, then went on doing some independent production. I also had a little boy two years ago which changed the whole picture! I now work for Wild Bunch in Legal & Business affairs. We deal on a daily basis with films directed by women, but we all work in medium-size companies, very committed to arthouse cinema. It is a different problematic. Generally speaking, there are still so many gender stereotypes… and women are not better than men on this issue… In a sector like cinema, it is essential to improve this. Q: Were you taking a career risk by starting an activist group? Have there been consequences for speaking out? As I said, the first big step only came a few days ago. There is always a risk to take position on such a political topic. We’ll probably get criticized (we already are!) but we will also have supporters. This is how it works. Q: Does FCTV Paris / WIFTV Paris support you? Other groups? Individual women screenwriters and directors? What about men? We actually never met FCTV and would be delighted to. We are in regular touch with the European Women's Audiovisual Network. We do have screenwriters and directors as members and hope to get more! Of course, there are men! But they are underrepresented (for once). Q: Where next for your group? We plan to create a Deuxième Regard Award in co-operation with several festivals. The Award will go to a film that subverts the traditional representation of men and women. The purpose is to support works that overturn gender stereotypes. Works directed by men and women. We can SIGN THE CHARTER ONLINE! The interview in German, on Belinde Stieve's site, SchspIN.